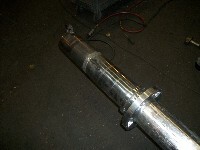 Auger shafts were worn from operation on the seal sufaces. From daily usage the seal sufaces were worn causing leakage. Metal Surgery metalized the worn areas and they were ground back to specifications. They were then cleaned and the flytes were staightened.